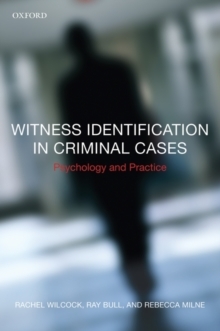 Witness Identification provides an up-to-date review on identifying crime perpetrators based on psychological theory and research. Applying psychology to the area of criminal identification, the authors make reference to relevant legislation such as the PACE Codes of Practice as they explore the psychology involved in identification. This insightful and practical title will inform anyone interested in this area. The authors outline the psychological information relevant to constructing and delivering identification parades, such as the point of view of the suspect and witness or victim, how witnesses remember, and the factors likely to affect the accuracy of person descriptions. They also consider the effects of stereotypes and expectancies on identification performance, as well as a discussion of the technologies involvedin identification procedure. The book includes a chapter on how to assist people who are deemed vulnerable in order to elicit accurate identification evidence. It also looks at other methods of identification in addition to face identification, such as methods to identify a person's voice and gait. By providing an overview of legislation and guidelines to conducting identity parades alongside a psychological underpinning, this book is a valuable resource to anyone whose work involves identification procedures, as well as students of psychology, law and police studies.